With more than 85% of the smartphone market in Russia, Android continues to be the country’s favourite operating system. The great variety of devices within a $200 price range supporting this platform, among other things, has contributed to Android’s popularity with Russians who are happy to compromise some of their smartphone’s technical quality, such as memory space, for its affordability. 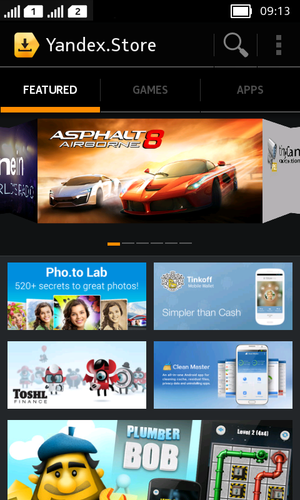 ‘There’s an app for that’ doesn’t really do it for a lot of budget smartphone users. To make life easier for the owners of budget Android-based devices we have offered them an all-in-one application for their everyday needs – from current weather, currency exchange rates or traffic conditions to what’s on in the cinema around the corner or the shortest way to the nearest bank or restaurant. We have reissued our search app for Android to provide our users with a one-tap access to our key services on their mobile devices. The new Yandex app has expanded its functions beyond search to include quick access to email, news, maps, city navigation, taxi booking, or any other service available in Yandex’s product range. To use any of these services one doesn’t even need to have a corresponding app on their phone – the refurbished search app will take them to the mobile version of the service at Yandex.ru. 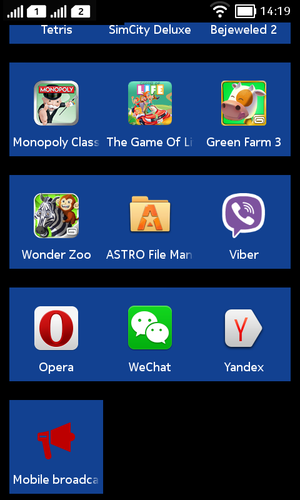 The new Yandex app allows the owners of low-budget Android-based smartphones to enjoy the full mobile experience without having to compromise anything. First announced in 2011, the Yandex search app now has a weekly user audience of over three million. The new app can be downloaded from Google Play. The users of Yandex.Search in Russia, Ukraine, Belarus and Kazakhstan will be upgraded to the new Yandex app when they update their current version. Buyers of Nokia’s new product in these countries will be able to funnel mobile apps for all their needs through our alternative Android app store, Yandex.Store, which is now featured in Nokia Store. Nokia’s range of Yandex-enhanced Nokia X smartphones will continue with Nokia X+ and XL with Yandex as a default search provider and Yandex.Store preinstalled. Nokia’s smartphones have always been popular in Russia and the CIS, not in the least, because of the company’s ability to cater for the specific needs of their customers in each of the markets. It’s only natural for Yandex, who always placed a top priority on relevance of service to a specific user in a specific location, and Nokia to join efforts to make sure the user experience of their customers is locally-relevant, smooth and seamless, even when they go from desktop to mobile, or from one mobile device or OS to another. Nokia’s decision to choose Yandex’s products for their new phones in Russia and Belarus ensures comfortable user experience for their customers in each of these countries, who already know Yandex and its products very well. We’ve been partnering with Nokia since 2011, when Yandex became a default search provider on Nokia’s Lumia 800 and Lumia 710 distributed in Russia. We’re now happy to have rekindled our old relationship through our support of the alternative Android ecosystem. The love of freedom of choice is what brings Yandex and Nokia together in this partnership. It follows that information about the hot topics in social networks is an important factor for a search engine in answering users’ questions. The intensity of discussion on any subject in social media is proof of the topic’s relevance, or “hotness” if you will. A search engine has to take this into consideration. Here at Yandex, we’ve always said that our specialisation is information-search services, aggregation and the structuring of content. We don’t compete with anybody in the sphere of social networks; instead we seek to collaborate with all the players. We see one of our key tasks as being the creation of social search services, using content from all the popular social networks in equal measure. We want to provide users with the possibility to receive answers that take into account the information that can be gathered from these resources. This would allow a user to find an old friend without having to register on every single social network one after another. It would also allow a user to tap in to all the discussions of some interesting event all together in one place. We’re already working with Twitter in such a way, and we index status updates in LiveJournal, VK and others. Today we’re announcing another important step in this direction: Facebook has granted us full access to its “firehose” of public data. This means that now, not only can Yandex search for people and company pages on Facebook, it can also search for content marked “Public” from users in Russia, Ukraine, Belarus, Kazakhstan and Turkey. Of course, anything users mark as “Private” will remain off-limits. At present, Facebook posts from users in Russia, Ukraine, Belarus and Kazakhstan pop up in search results only on the Blogs part of Yandex Search, but soon they will be added to the service’s main Search page, giving users even fresher answers to their questions about recent and current events. Along with answers to such queries, Yandex will add up-to-date articles and videos, among other things that have had great resonance among Facebook users. In addition, the popularity of materials in the social network will be taken into consideration when ranking search results. Those of our users who take their internet safety for granted, can keep doing just that with our new internet security solution Yandex.DNS. The Domain Name System (DNS) structures information on the world’s interconnected computers by associating it with names – conventional webpage addresses for users and sequences of digits for computer programs – and continually running and updating a ‘catalogue’ of these names. This structure allows people to access webpages through their browsers. By having one’s own, customised DNS, a web user can choose which webpages can be in the scope of their browsing. With three security-level modes to choose from, Yandex.DNS installed on a personal computer, mobile phone or router lets users customise internet experience for each member of their family on each internet-connected device in their household. To start receiving Yandex.DNS protection on their personal computers or mobile devices, web users in Russia, Ukraine, Kazakhstan and Belarus can follow easy and simple step-by-step instructions on the service’s website (available in Russian). When installing Yandex.DNS at the router level, the Secure mode is offered by default, with an opportunity to choose the Family or Standard security levels. One mode can be selected for all devices in the user’s network or each device can have its own security level – the Family adult content filter for kids’ mobiles, the Secure mode for dad’s iPad and zero protection for the piggybacking neighbour. Owners of Zyxel's Keenetic series home routers can download Yandex.DNS to their devices right now. D-Link's DIR-615/K2 and DIR-620 routers are currently in the pipeline with other router manufacturers expressing an interest in giving their customers an opportunity to install Yandex.DNS and protect their networks. To take the installation pain off our users’ shoulders, we are working on getting Yandex.DNS preinstalled as firmware on home routers shipped in Russia and neighbouring markets. Yandex has long been waging war on internet threats, developing a whole range of products and solutions to help web users have a safe internet experience. Our very own, behaviour-based anti-virus technology detects malware on 4,300 websites and helps us show to our users about 8,000,000 malware warnings every day and protect them from malware that spreads via Java applets. We use our own adult content filter in our search results. Integrating our anti-virus technologies, Yandex.Browser provides safe browsing for internet users, with Opera and Firefox also enjoying our malware protection via the Safe Browsing API. We can also notify website owners about malware threats on their pages via our Yandex.Webmaster service and help them fix the problem. Yandex.DNS incorporates all of our malware protection experience. It shares database of malicious and adult content websites with Yandex Search and Yandex.Browser.